A poster advertising the Ali-Liston match. Tom Porter reports on a documentary that chronicles the Muhammad Ali - Sonny Liston fight in Lewiston 50 years ago. LEWISTON, Maine - Fifty years ago on Monday, the city of Lewiston was in the international sporting spotlight when world heavyweight boxing champion Muhammad Ali came to Maine to defend his crown, for the first time, against Sonny Liston. It was a short-lived match, with Liston knocked out in the first round. But what the fight lacked in substance, it made up for in drama, both inside and outside the ring. On May 25, 1965, Muhammad Ali fought Sonny Liston at the Central Maine Youth Center in Lewiston. It wasn't the best title fight on record. It was over before the end of round one. But film-maker Gary Robinov of Portland agrees it was probably the strangest. "It was the smallest attended world heavyweight championship fight, in the smallest town in history," he says. "Still, I mean it is just such a bizarre thing." Robinov, whose new documentary "Raising Ali" examines the fight and the impact it had on the city of Lewiston, says nearly everything about the match was unusual. It was originally scheduled to take place in Boston until the Massachusetts attorney general banned it for a number of reasons, including the concern that it could be a flash point for a civil rights disturbance. "The Vietnam war was going on. Two months prior they had just marched in Selma," Robinov says. "There was a lot of stuff going on in this country, so, you know, you add the speculation that Liston had mob ties, the state AG of Massachusetts basically said, 'We don't want it here, we don't believe it's going to be a fair fight, we don't think it's a safe fight.' "
Hear more from filmmaker Gary Robinov. Less than three weeks to go before the opening bell, and here was a world title fight without a venue. Enter Sam Michaels, Lewiston native and well-connected boxing promoter, who decided the best option was to bring the show to his hometown. 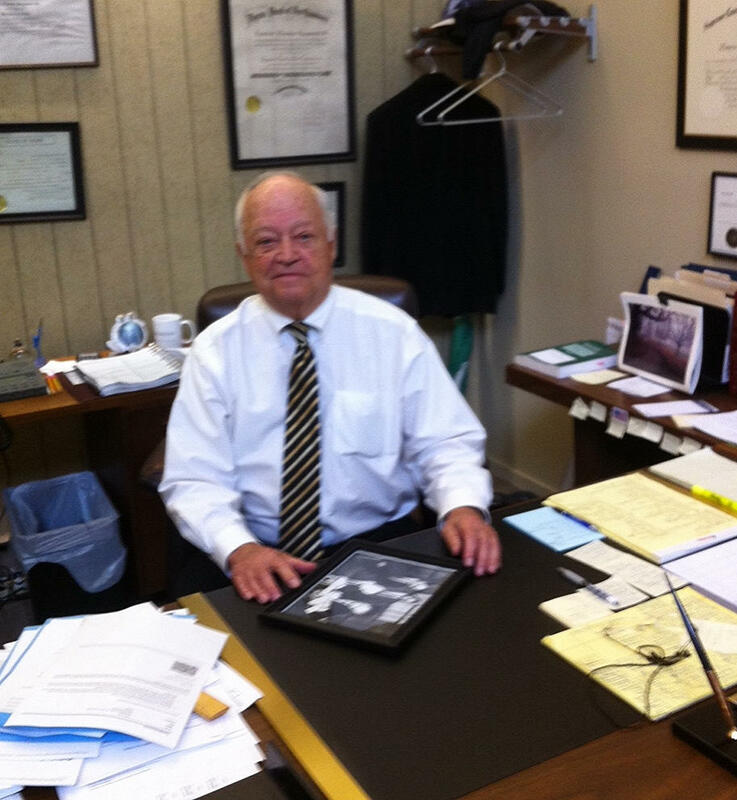 Lewiston Attorney Larry Raymond, who was among those who helped boxing promoter Sam Michael bring the Ali-Liston fight to Lewiston. "Sam was the type of guy that would do that real quickly," says Lewiston Attorney Larry Raymond. Raymond was among those who helped Sam Michael bring the fight to Lewiston. Sonny Liston - a.k.a. "The Bear" - established his pre-fight training camp at Maine's Poland Spring Resort, where members of the press and other observers were impressed by his size and strength. "He was a very quiet guy, didn't have much to say," Raymond recalls. "I met him a couple of times, shook his hand, he had a hand that was bigger than twice of mine." For those two-and-a-half weeks before the fight, the circus came to Lewiston, says Gary Robinov. "The press starts arriving. There was more press in Lewiston, Maine - there were approximately 600 reporters - which is more reporters than covered World War II. Then came the night of the fight itself. The 2,500 seat stadium - normally home to a hockey rink - was overflowing. This was the Ali's first fight under his adopted Muslim name - a fact that escaped some of the commentators. Audio from newsreel: "The champion defending his crown tonight, Cassius Clay..."
As the fighters were introduced, it was clear that Liston was the favorite, while Ali, a controversial figure viewed with suspicion by mainstream America at the time, was booed by many in the crowd. Audio from newsreel: "We're waiting for that bell for Round 1. (Bell rings) "Here we go." Portland-based boxing coach and promoter Bob Russo had a ringside seat for the fight as a 9-year-old. "He kind of drew you in, and he'd drop a right hand counter-punch on you." On that night, Russo he was a 9-year-old boxing fan with a prized ringside seat, thanks to his uncle George, who was head of the Maine boxing commission. It was a brief and disappointing fight, he says, but he recalls every moment of it. 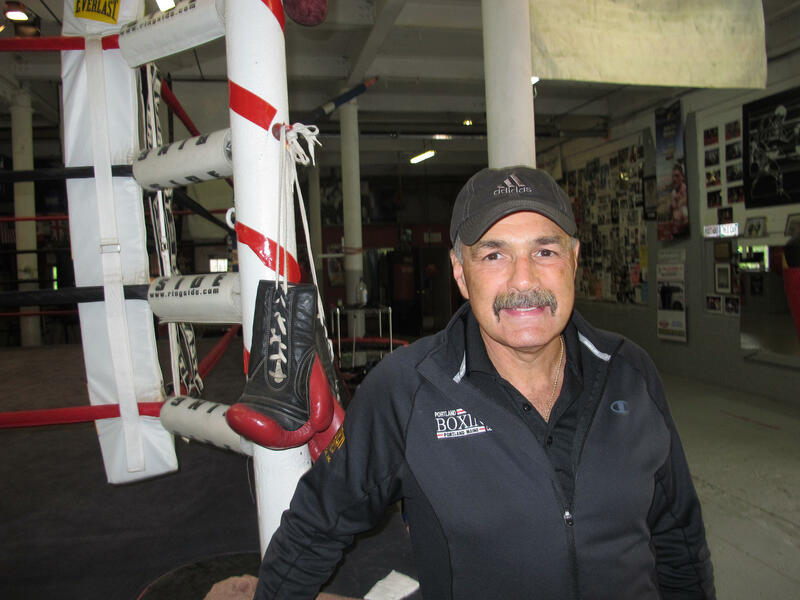 Hear more from boxing coach and promoter Bob Russo. "Liston was kind of coming in trying to desperately cut the ring down on him, which is always a problem with someone like Ali," Russo says. "So you get a little bit desperate and you start to reach for him and stuff like that, and he was kind of leaning forward and Ali clipped with the right hand and he went down on all fours." Audio from newsreel: "A right hand shot on the chin..."
That was Ali's now infamous "phantom punch," which came less than two minutes into round one. It's visible in slow motion replays, but few can recall seeing it at the time. In fact, many who were there seemed to miss the fight altogether. Among them, Larry Raymond. "As the bell rang for the first round, I turned around and put my wife's stole on the of her chair, and when I looked back, Liston was on the canvas. "The fight started and was, for all practical purposes, over almost before we sat down," says Paul Gosselin. The 13-year-old Gosselin was there with his father, returning from the concession stand, when the fight began. "My dad over the years kidded me saying, 'We didn't miss much Paul - no one else saw the punch.' "
The end of the fight is perhaps the strangest part of the story, says Gary Robinov. Many forget this, he says, but Liston actually got back on his feet after being put down. "They re-engaged, so at 1:44 the punch happened, and somewhere around 1:56 they're back up and fighting." Shortly afterward, referee Jersey Joe Walcott stopped the fight and declared Ali the winner. But that was only after the intervention of someone who was not even an official. "If you really want to know who stopped that fight, it was the editor of Ring magazine, who said, 'No, this fight's over,' " Robinov says. He's talking about boxing journalist Nat Fleischer, who pulled the referee aside and pointed out that Liston had been on the canvas for 12 seconds and should not be allowed to continue. Bedlam ensued. People were angry. But for the youngsters in the crowd, like 9-year-old Bobby Russo, who has always been a fan of Ali, the evening was a chance to witness the birth of an American legend. "He was an iconic person in history - more than boxing, he was much bigger than boxing." The documentary, "Raising Ali" will be shown at 9 p.m. on MPBN television on Monday, May 25. Learn more about the film.